Governors and politi­cal leaders from the South-east geo-po­litical zone met weekend in Enugu and expressed con­fidence that an additional state will be created in the zone before the tenure of the present administration expires. The meeting, which held be­hind closed doors at the Enugu State Government House, also expressed satisfaction over the performance of delegates from the region at the just concluded National Conference. 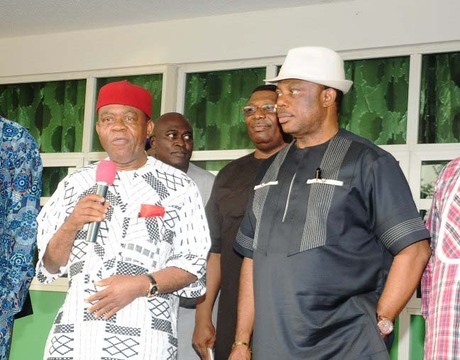 Addressing journalists at the end of the meeting, the Chair­man, South-east Governors Forum, Chief T.A Orji of Abia State, said, “We met to review the outcome of the just concluded confab. We sum­moned the meeting to find out whether what we discussed with the delegates before they went for the Confab is exactly what happened. “Those delegates did very well in articulating our points. Those points are contained in a document that had been pre­sented to the President. Promi­nent among them is the issue of creation of states. It is sensitive to the zone, and they were in a position to argue for additional state for the South-east zone. “Topmost is to give us, one additional state, to bring us at par with other zones in the country. So, we are happy with them, and that is why we have come to get briefs from them. They have told us, and we are satisfied. If there are amend­ments, they will come later”. On the issue of security, Governor Orji said, “We are doing our best to ensure that every state in the South-east is putting all in place to make sure that lives and property are protected. You can at­test that there is a decrease in the incidence of kidnapping, armed robbery in this part of the zone. “It is as a result of efforts the South-east governors are mak­ing. The last time we met here, we told you that we are mak­ing efforts jointly to purchase a tracking equipment that will boost security in the region. The effort is still on. When it comes on board, it will help us”. Governors that attended the meeting include the host, Sullivan Chime (Enugu), Martin Elechi (Ebonyi) and Chief Willie Obiano (Anambra). Governor Rochas Okorocha of Imo State was represented by his deputy, Prince Eze Madumere. Other dignitaries include; Senator Uche Chukwumerije, Senator Ayogu Eze, Speaker, Enugu State House of As­sembly, Barr. Eugene Odoh, Chief Mbazuluike Amaechi, National Vice Chairman, PDP, Col. Austin Akobundu, Min­ister for Labour and Produc­tivity, Chief Emeka Wogu. Can Gonzalo Higuain Bring The Firepower Sarri Seeks?